Don Meyer is an author of a new series he unofficially refers to as The Sheriff Tom Monason Mysteries, and this is the second in the series, with a third due out next year. Mr. Meyer has also published at least two other books outside this series. I read the first one and I probably should have added a review to the Amazon page. Maybe I shall do that soon to complement this review, since the two books are distinctly similar and connected thematically. Although I have never read any of Robert B. Parker's books in the Spenser or Jesse Stone Series, I absolutely love the movies made of the JS books by Tom Selleck, and Meyer's two stories are a mirror image of those. Whereas Stone is an alcoholic LA cop who retires to a little seaport resort in MA, Monason is a big city cop who retires to a mountain resort town in Northern California. Think Tahoe or Big Bear for the basic scenery, although Monason's town is a bit quieter and more isolated. A couple of people get murdered and Monason solves the case with old-school craftiness and small-town charm, sort of like Andy Taylor without the laugh track. Monason rarely fires his six-shooter he calls a wheel gun and he has an ongoing relationship with a cute deputy a few years younger. This description could more or less be applied to Winter Ghost as well as McKenzie Affair. The biggest difference between the Parker and Meyer books is probably length. 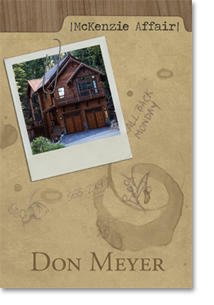 Don Meyer's books are quick reads of show-don't-tell characters and dialog, with very little detailed description. I usually prefer the lengthier type of read, but not in this case. I LOVE the story lines, characters, settings, and compositional style of both McKenzie Affair and Winter Ghost! I would give them both five stars for providing entertaining reading except for one glaring flaw. These works need to be edited and proofread a lot more effectively, particularly the proofreading. There are missing commas and overused ellipses out the wazoo, and most of the ellipses are missing their ending punctuation. There are a number of other common mistakes, too, but much lesser in frequency. These mistakes did not slow down the reading, but I did have to consciously look past them. The final verdict: technical production, C-, engrossing storyline, A+.